The first Smurfs appeared in 1958 and some 50 or so years they continue to delight. Two new Smurf movies (The Smurfs in 2011 and The Smurfs 2 in 2013) have brought the Smurfs to the attention of a new generation . The Smurfs were characters in a series entitled “Johan and Pirlouit”, drawn by their creator Peyo (Pierre Culliford). The first actual figurines appeared some seven years later in 1965. Since then they have attracted interest from collectors all around the world. Each year Schleich produce a range of Smurf figurines. 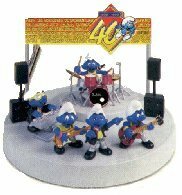 There are normally 100 different Smurfs available from the main range, as well as a number of Super Smurfs and accessories. Each year a few are withdrawn (not always retired) and a few take there place. It has been interesting over the years to see how the Smurfs have evolved and mimic popular culture.Certain Smurfs have become quite valuable, and there are many colour variations of certain Smurfs which adds interest. The most sought after Smurfs are those that were used as advertising material, certain colourways, and the Jubilee Smurfs. Pictured right is the special 40th Anniversary boxed set released in 1998, which featured a rock band and stage. The figures were also available individually, but the colouring of the costumes differs. The Smurfs in the limited edition boxed set all have silver clothing. The majority of Smurfs can still be found relatively cheaply and their history and the range available make them an excellent collectable. Exclusives, Limited Editions, Specials and early editions are beginning to fetch a premium. With the new movie franchise attracting a new generation of collectors, Smurfs figruines and Smurf toys could see a rise in their values.